In 1703, an English chap did coke, and by did “coke” we mean roast malt with fuel derived from coal, “coke,” resulting in lighter roasted malts that produced paler ales. Someone called it a “pale ale,” since the ale in the glass was visibly lighter when placed next to the other beers at the bar. In addition to the lighter color, because the resulting malt had a milder flavor, the hops were able to shine through more prominently, thus pale ales came to be associated not only with their pale color, but their mild hop flavor as well. In 1829, English chaps living in the British colony were stunned when their imported English pale ales were hoppy AF due to the much stronger backbone of hops and alcohol, protecting them on their six-month journey across the sea. And thus, the IPA was born. Technically, an IPA is a more assertively hopped and stronger version of a pale ale, yet what that actually means differs depending on the brewer making both beverages. Today, Peaks and Pints presents a flight of pale ales that we call the flight Craft Beer Crosscut 12.4.18: A Flight of Pale. As an added bonus, we added an extra beer to our typical five-beer flight. Oh, pale yes! Flavorful, effortless, refreshing, crisp and dry are the identifiers that usually signify a beer that’s highly crushable. But Evil Twin Brewing Think Of A Beer You Would Want to Crush On Fire Island’s notion of “crush” takes on a whole new meaning. Enamored with the hazy, the juicy and the smooth, Evil Twin brewers put on their seduction skills with a pale ale done the New England way. The aromas draw in the senses with a full-fledged fruitiness that hangs on melon, citrus and tropical fruit. Modern Times scored a bunch of Grade A Nelson Sauvin hops. We’re talking the good stuff. Peaks and Pints knows. Modern Times came clean with the Nelson for our Aroma of Tacoma hazy IPA we brewed at Three Magnets Brewing. Thanks Modern Times! Nelson is front and center in the Dymaxion hazy pale ale with various New Zealand hops along for the ride. With 2-Row, white wheat and golden naked oats leading the grain bill, Dymaxion yields an intensely aromatic profile that marries a bouquet of tropical characteristics with crisp, biting citrus over a dry malt backbone. 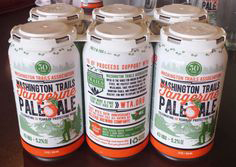 Bellevue Brewing’s Washington Trails Association Tangerine Pale Ale is brewed to be enjoyed with alpine views, summit sunsets and your favorite hiking companions. This citrus pale ale’s swirling hop aromatics, a smooth malt body, sweet orange peel and tangerine zest combine with a smooth, crisp finish. It tastes even better when you think about the one percent of proceeds from sales that benefit WTA helping power our hiking guide, trip reports and volunteer trail maintenance teams. In 1989, Boulevard Brewing launched with a spotlight on its Pale Ale. 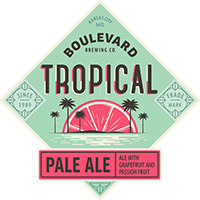 Inspired by Boulevard Brewing’s collaboration with Florida’s famed Cigar City Brewing, Tropical Pale Ale marries Boulevard’s passion for balanced pale ales with the bright refreshing flavors of grapefruit and passion fruit accented by juicy, citrusy hops. If Tropical Pale were a style, this would be it. Pack your bags and bring your taste buds. Pacific Crest Trail through-hikers often stop at Dru Bru brewery and taproom at Snoqualmie Pass because they’re exhausted and love delicious craft beer. For the uninitiated, the Pacific Crest Trail is the transcontinental trail that stretches from the Mexican border to the Canadian border and happens to cross Interstate 90 very near Dru Bru. 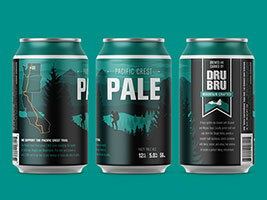 Pacific Crest Hazy Pale Ale is brewed with Ekuanot and Mosaic hops, as well as malt and oats from the Skagit Valley for a smooth malt backbone that combines with berry, melon, and citrus hop aromas to create a lovely hiking refreshment. Born Yesterday is a newborn version of Lagunitas Brewing’s re-born Pale, a newer New Dogtown Pale with a fresh addition — wet, lupulin-drenched, un-kilned, whole-cone, fresh-picked-and-rushed-straight-from-Yakima hops. The Northern California brewery packs a crapload of fresh Mosaic, Equinox, Simcoe and Citra hops for a zesty aroma followed by the fruity sweetness and bitter grapefruit.